One of my favorite views in Providence, RI is driving behind the State House, overlooking onto the East Side, and seeing all the beautiful homes stacked across the Hill. It’s no surprise here that College Hill was ranked high in Thrillist’s 10 Most Beautiful Neighborhoods in America! Though one of my favorite scenic views, I don’t stick to simply admiring it from afar. Take a stroll, or grab one of those Birds that flood the sidewalks, and explore the historic charm that is rooted in this city. Street by street the curb appeal does not disappoint…and this week’s feature home is no exception! We had the pleasure of viewing this home last week and we knew right away that we just had to share it with all of our readers. 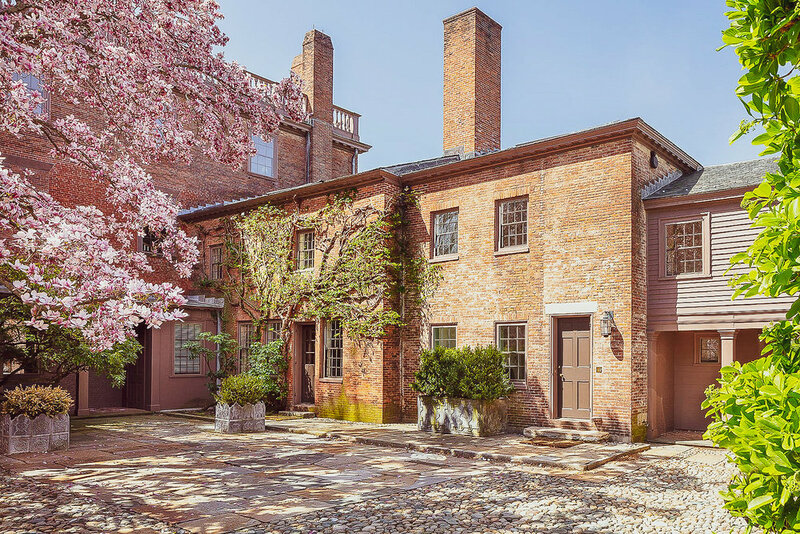 Built over 200 years ago, this stunning and truly historic estate sits on almost an acre of land, which in retrospect may not seem like a lot in comparison to all our other featured homes on this blog, BUT for the East Side this is a rarity! Given this generous size, the landscape design on this property makes use of every square foot offered. The gorgeous gardens, the graveled walkways, and the abundance of plants and flowers enveloping the brick facade, take the classic, historic look and turn it into this warm and inviting aesthetic. I can only imagine that having this as your backyard would be such a refreshing view each and every time you see it…especially when transitioning from winter to spring! Whether you are entering from Williams Street or from the side courtyard you will be greeted with a spiraling staircase luring you in to this magnificent home. Each entrance has it’s own style; the Williams Street entrance is the formal foyer featuring beautifully preserved colonial architectural details. The courtyard entrance has maintained its farmhouse aesthetic, once the keeper’s entrance, this space seamlessly flows into the kitchen in the adjacent room, or take the stairs up to the barn. Either entry can be decorated by the next homeowner more or less formally depending on the first impression one wants to make. Entryways are always a great space to showcase artwork, whether it be hung on the wall or in the form of a sculptural piece. The spiral staircases in either space creates perfect placement for a sculpture. Everyone has a certain space in their home that they love to go to so they can relax and unwind after a long day. This Eastside home has not one, not two, but multiple spaces that offer an opportunity for a personalized oasis! These are my favorites. 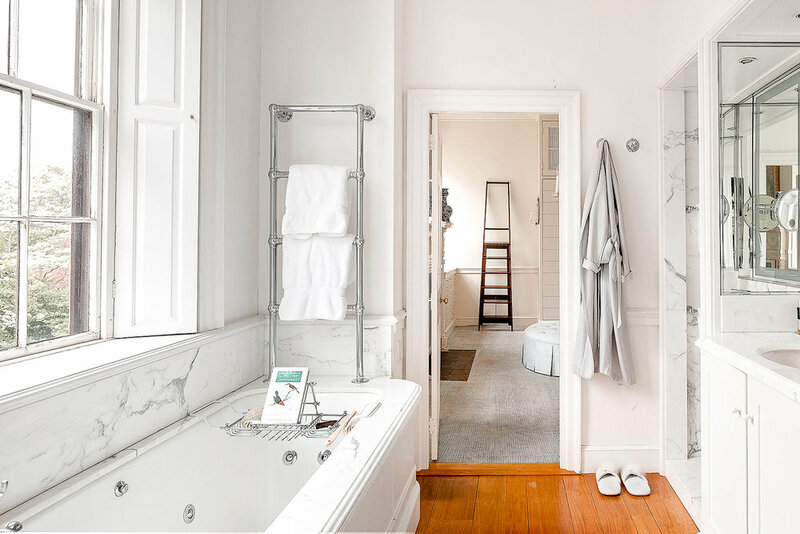 The crisp ‘pure palette’ bathroom with white walls, a white soaking tub, carrara marble shower and a hardwood floor offers a minimalist design that is clean and light. I can definitely see myself relaxing in that tub and indulging in a good book! Next I must mention the home’s 2 story library. Once again, the overall use of material, color palette, and even furnishing in this case, is kept at a minimum so that the natural light can penetrate deep into the space. Given the size and opportunity for an array of niches and function, you can continue to use this room as a library or for the art collector it could make for a fantastic gallery space. With the fireplace situated on the first level and the mezzanine framing it above, this space [no matter what use you make of it] is a hideaway you wont get tired of. Lastly, there’s the open barn space that was restored into a grand entertaining area. You can definitely use this space to host many glorious parties and celebrations but it can also be used as a fully furnished space for daily use as well. If you have some little ones running around in your home, this vast area is the perfect floor plan to create a study, leisure, and play area all in one! The rustic and beautifully raw aesthetic that the barn provides is very unique in comparison to the rest of the home’s interior and actually ties you back to the charmed exterior. As I’ve already mentioned multiple times before, this home functions as an interior design chameleon for any incoming owner taking over. Its been around since 1810 so its had to adapt over the years and because of its good bones and functional framework, it can stay as is or be styled into the exact home you envision. Take this kitchen, for example. Though meant to be solely a chef’s kitchen, it was still designed with nice detailing to create a beautiful and inviting space. 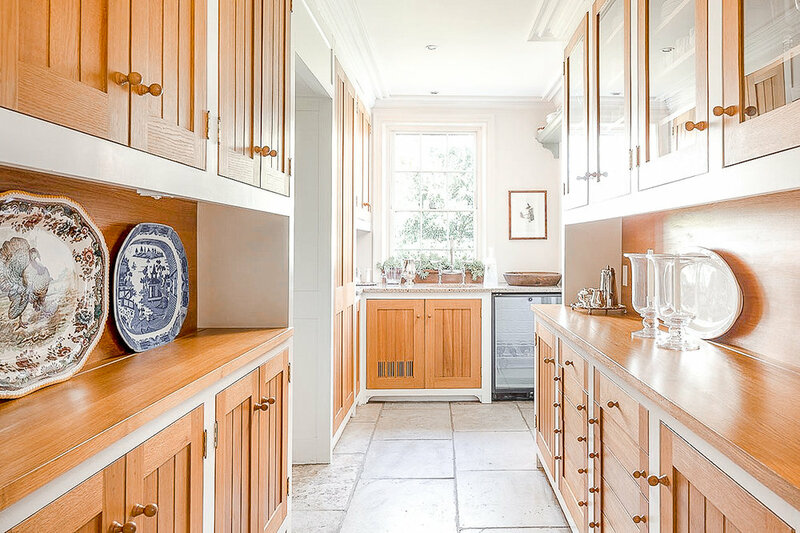 The use of natural materials, with the carved wood cabinetry and concrete tiled floors, give this kitchen a simple and clean finish that builds the foundation for an even more elaborate design, if desired. 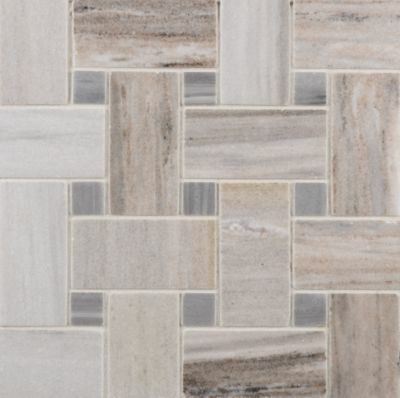 For instance, just picture one of these tiles below as the backlash, to add a pop of color, keep the minimalistic approach, or embrace the timeless aesthetic… and then pair it with a dining table of your style and you have a kitchen that is designed for you. I saved this for last because these spaces are just absolutely breathtaking and so unique that I wanted to make sure you finished this article with a serious case of house envy! Wallpaper is one of the best ways to add the right amount of personality to any given room and that’s exactly what is happening in these two spaces. The living room features a stunning design with a special node to the generations of family previously residing in the home, and the delicacy of penmanship creating the peacock design is so radiant that it doesn’t even have to be your family’s crest for one to appreciate it. 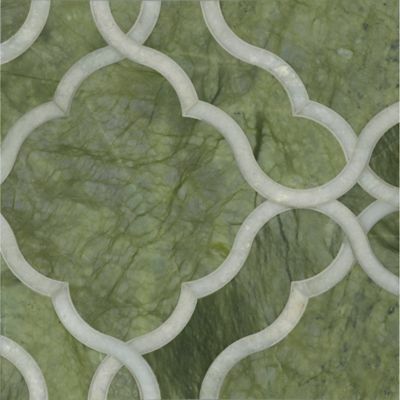 This gorgeous wallpaper will compliment any style furniture that the next home owner may bring with them. 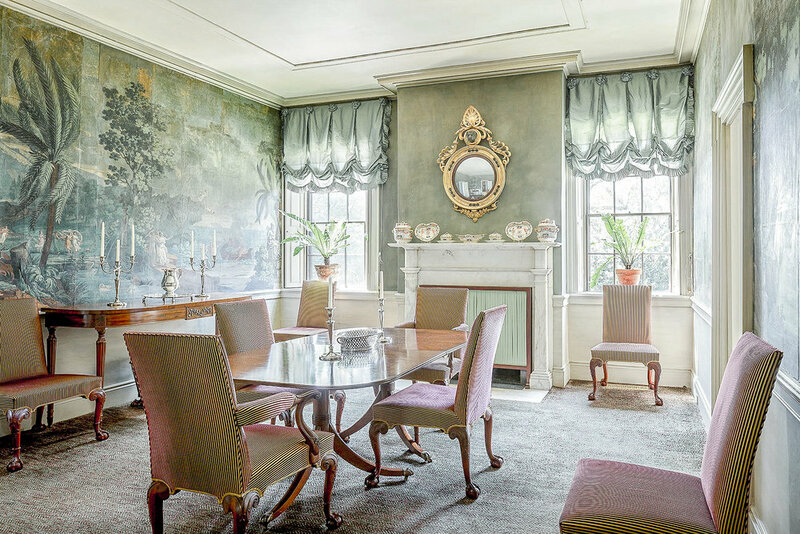 The same goes for the beautiful wallpaper in the dining room, a rare French design by Dufour, the soft green palette and intricate pictures created in the design add a pure elegance to the space that can either be enhanced or muted down depending on the select furniture added in. If you'd like to learn more about this home, please contact Heidi Farmer or Liz Andrews at Mott and Chace Realty.